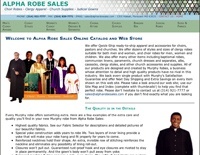 Alpha Robe Sales sells choir robes, clergy apparel, church supplies and judicial gowns. This custom eCommerce website by Blue’s ArtHouse has been redesigned several times since its original incarnation in 1998. These are one of our longest term customers. The owners of Alpha Robe Sales are Blue’s parents!